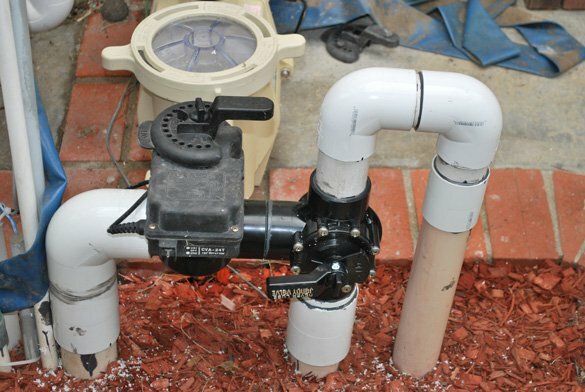 While completing our weekly pool cleaning for a customer in Tierrasanta the service technician noticed the Pentair Whisperflo variable speed circulation pump sucking in air. 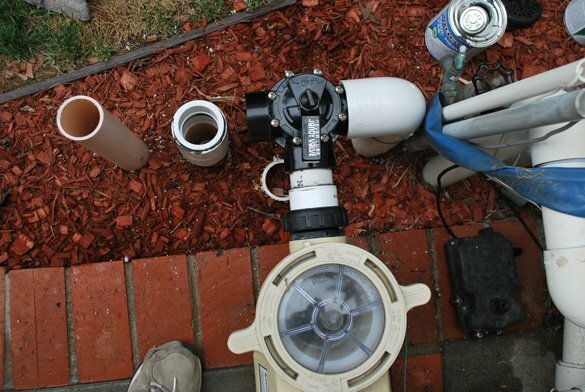 He informed the San Diego homeowners of the pool pump leak. They told us that the automatic pool vacuum had be taken out of the pool while still attached to the suction line. This had caused the pump to overheat and the inlet side plumbing to warp, causing the leak. 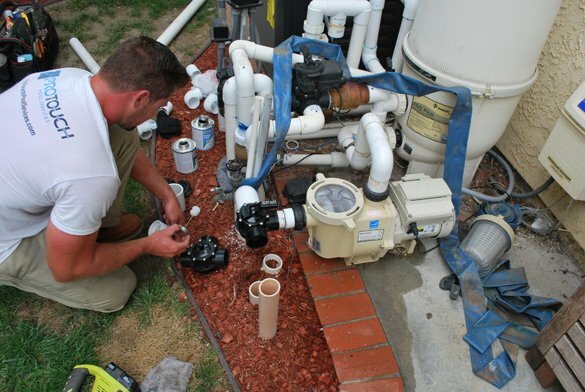 We quickly scheduled to repair the pool plumbing so the family could resume enjoying the pool. 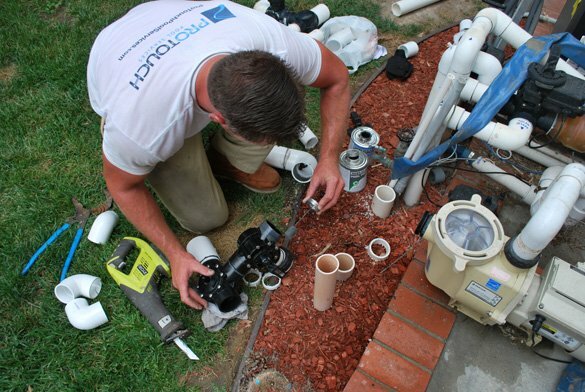 Our pool equipment repair technician began by cutting out the existing melted suction side plumbing valves and pipes. 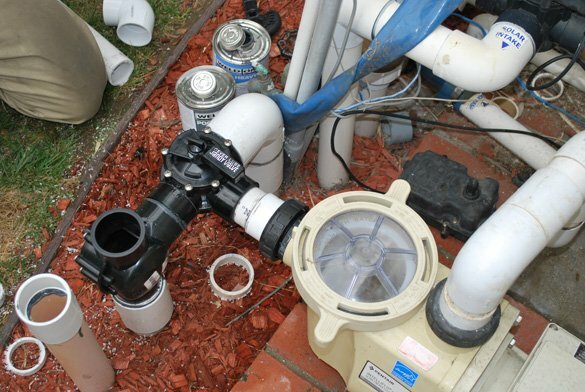 After removing the broken fittings a 2 inch Jandy NeverLube 3 way valve separating pool and spa suction was installed. Then a 2 inch Jandy NeverLube 3 way valve separating pool skimmer suction and vacuum suction was attached to the other valve. 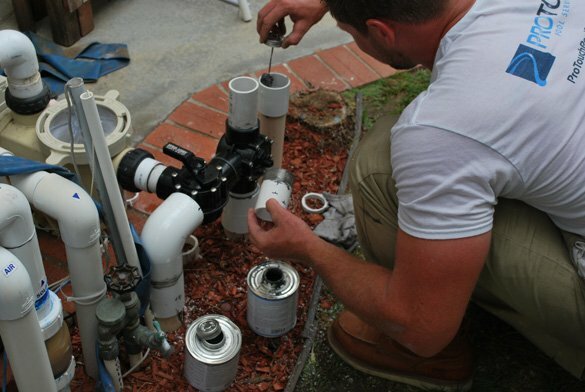 We then attached the hi temp pvc unions to the Pentair Whisperflo variable speed filter circulation pump. Finally the Pentair Compool CVA-24 valve actuator was attached to the pump inlet. The pool pump was up and running that same day.